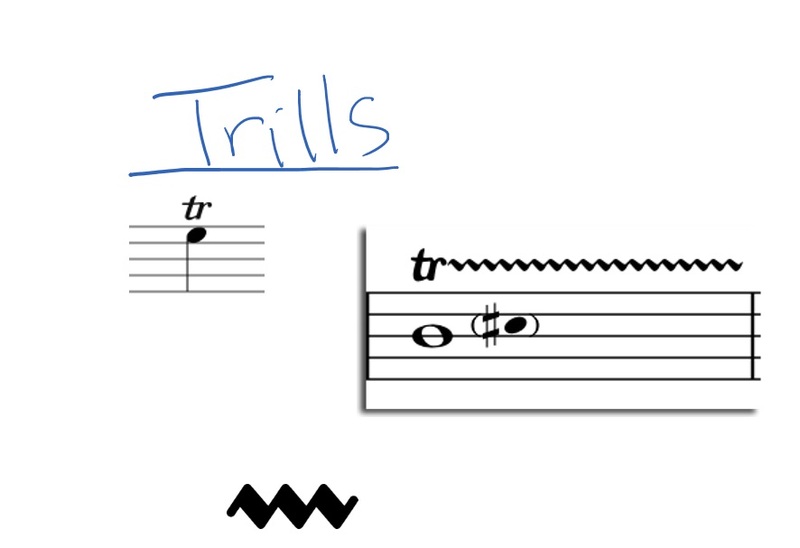 To compound the confusion, there are different rules for trills depending on what era your music is from – and some trills aren’t absolute laws, but mere suggestions. We’re going to unpack all of this today. My goal with this video is to give you a basic reference for any trill you might come across. We would technically call trills “ornaments”. Ornaments include all kinds of different finger twists and turns, and trills are a specific type of ornament. So what are they? Well, ornaments are there to – you can probably guess this – ornament the melody. The melody is the main tune of a piece. Think of the melody as a Christmas tree. Adding ornaments and decorations to the tree doesn’t change the shape of the tree (the melody), but it adds interest and variety. Usually ornaments sound fast and frilly. To give you an example, I’m going to play a super-short melody by Haydn, first without any ornamentation (a bare Christmas tree), and then with ornamentation. It makes the tune much more interesting and lively. Let’s talk about them one by one – how they’re notated, and how to interpret them. The trill is probably the most common ornament you’ll come across. It’s marked with either “tr”, a long wavy line, or a combination of both. The most common type of trill is a diatonic trill, which just means you alternate two notes that are a whole step apart, like D-C or B-A. Depending on the piece or the length of the trill, you might play the trill evenly, or you might start slowly and gradually build up speed. If it’s not indicated one way or another, what I usually do is compare several recordings and see how professionals interpret it. The length of the trill, ie how many notes you’re able to alternate, depends on the piece. If it’s a long, held note, you can play a long trill. But if you just have a beat or half a beat, your trill might only include one or two turns. Trills almost always start on the note higher than the one that’s written. So if you’ve got a C with the “tr” symbol above it, you’ll almost definitely be alternating D-C, starting on D.
A mordent is sort of like a super-short trill. 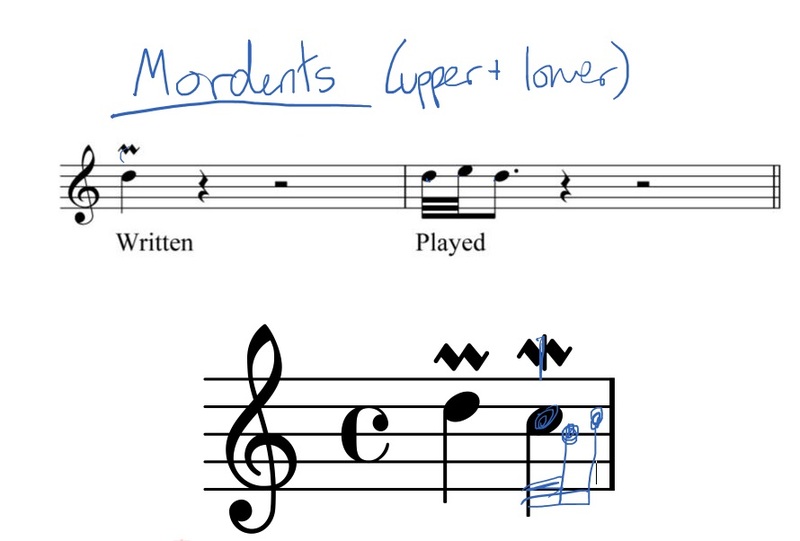 An upper mordent, indicated by a plain squiggle, means you’ll do a quick turn between the note written, and an upper note. So if the note written is a “C”, you’ll play an upper mordent like “C-D-C” very quickly. A lower mordent, which is a squiggle with a line through it, means the same thing, only you do a turn with the lower note. If the note written was an “E”, you would play “E-D-E” very quickly. A “turn” sort of looks like a figure 8. It usually means there’s a four-note pattern where you start on the upper note, play stepwise going down, then turn back up. 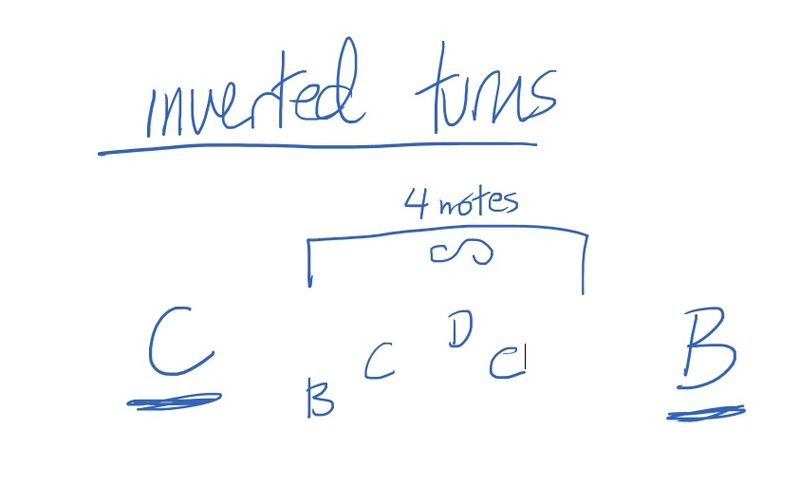 There are several ways turns are notated – usually either between two notes, or on top of a note. 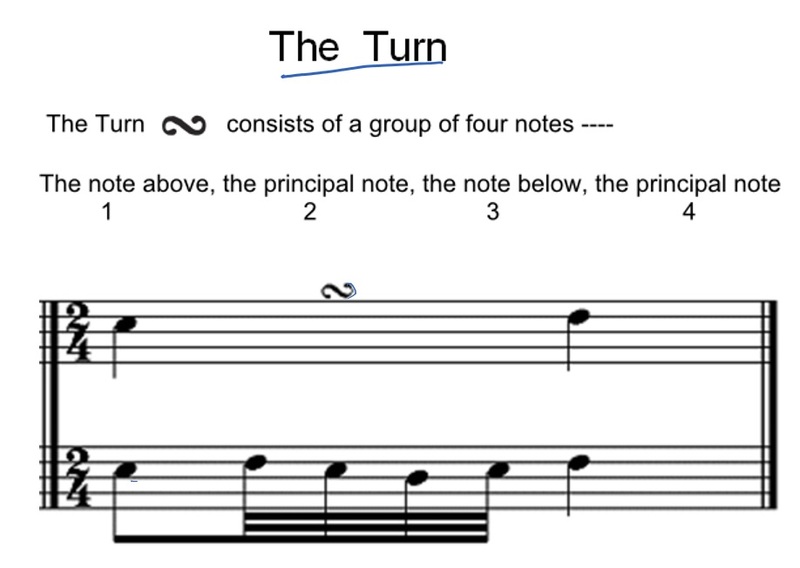 Let’s start by talking about a turn written between two notes. 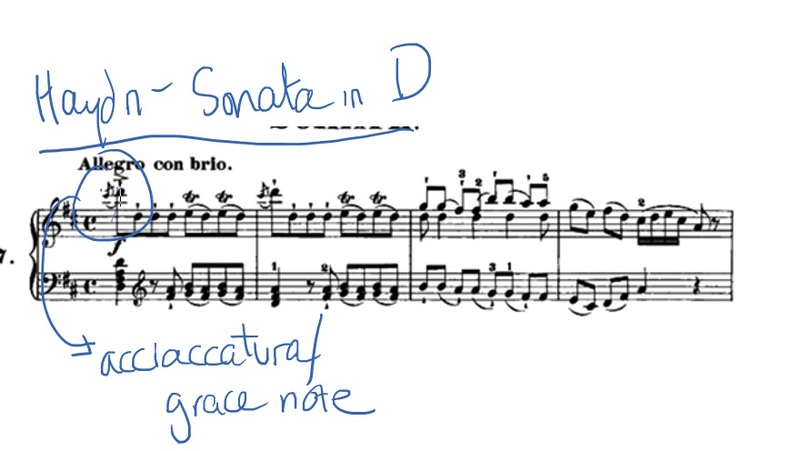 Say you have a C-D-E notated in music, and there is a “turn” notated between the C and D.
This is usually indicated by the composer drawing a line through the turn symbol, or making a note of it in the sheet music. We’ve discussed appoggiaturas on this channel before, and how they’re a useful songwriting technique. They’re usually written with a tiny note beside a grown-up note. These look more complicated than they are. Say you have an appoggiatura written beside a half-note C. All it means is that you divide the note’s value in half (two quarter notes), and play the small note to the main note. That’s it. There’s nothing fast involved in these – their purpose is to delay landing on the “main” note, which is a way of prolonging tension. It’s important to note that appoggiaturas are written as tiny notes with no lines through them, because that’s the subject of the next category. For our intents and purposes, an acciaccatura is a grace note. The main difference between these and appoggiaturas is that these ones are played quickly, almost like a flick of the fingers. They’re marked with a line through the stem. For the rhythm, the grace note is usually played just before the main beat. You want to finish the grace note on the beat – you don’t want to start it on the beat. It really depends on the composer. As always, be sure to check the first pages of your book for any reference notes, and when in doubt, listen to some good performances. Before finishing this video and sending you on your way, I wanted to make a quick note for the Baroque era. There are way more squiggles and ornaments in most Baroque music than you’ll ever see in Classical and Romantic music. So when in doubt, check out this guide. We’ve talked about trills and we’ve talked about mordents. Sometimes the two get combined – the look is pretty self-explanatory. You’ve got the trill symbol that turns into a mordent symbol at the end. 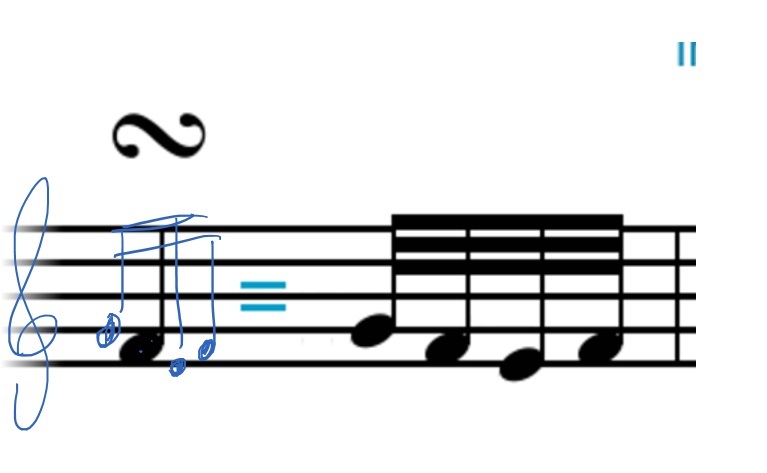 #4, what’s marked as a cadence, is the “turn” we talked about earlier. #5 and #6 have slur-like markings at the beginning of the trill symbol. If your follow their shape, you either start on the note above or below, do a little “turn”, and then turn that into the trill. #7 and #8 are hybrids of all three: The turn, trill, and then the mordent. 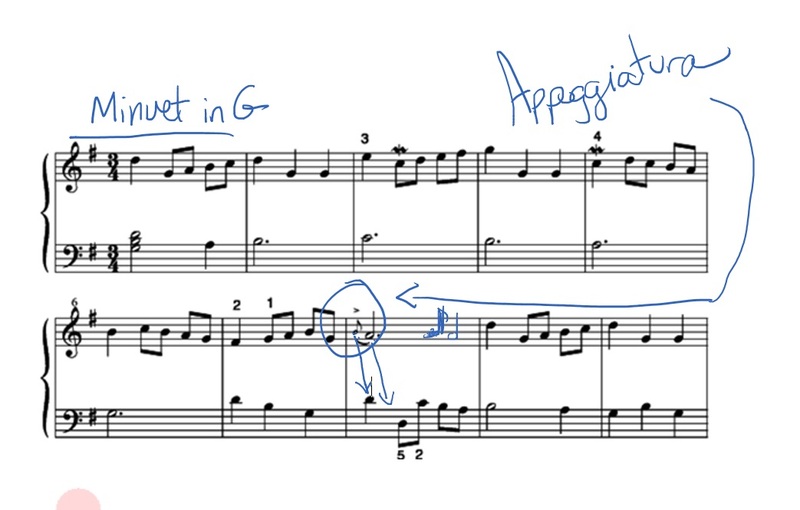 #9 and #10 are the appoggiaturas we talked about previously, just notated in a different way. #11 is an appoggiatura with a little lower mordent thrown in there. #12 is an appoggiatura with a trill at the end. #13 is the exact same, just written in a slightly different way. I hope you’ve enjoyed today’s tour through ornaments! Thanks for watching, and I’ll catch you guys next time.